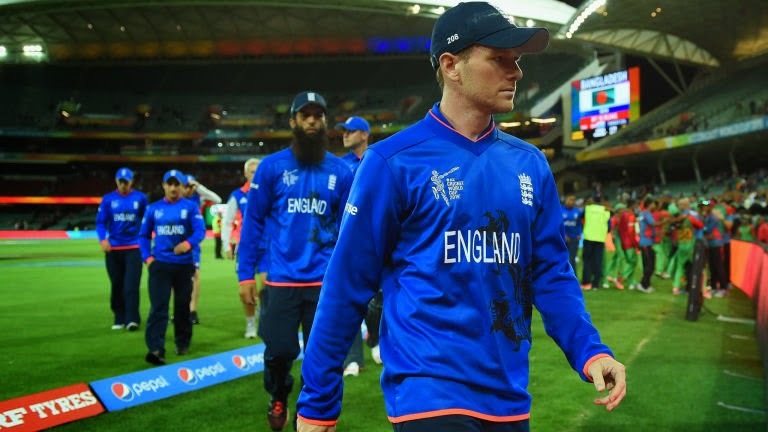 2015 will go down as another disappointment for English cricket. On the stage of the World Cup, the Three Lions once again made a premature exit as their woes in the shorter format of the game continued. In a nail-biting 15-run margin, Peter Moores' side were edged by a spirited Bangladesh performance in Adelaide to bring an end to English hopes and sealing another World Cup disaster. England will play Afghanistan on Friday—a meaningless fixture, instead another time to bare the excruciating sorrow before their bags are packed for their departure from the Oceania continent. In the meantime, they could just be in for a slaughtering from the press with the fundamental concept—everyone else can see the problems except the players and authoritative figures of the English Cricket Board. Was it already a forgone conclusion? Problems were apparent from the start as they fell woefully to both co-hosts. First, the Aussies trampled over them with a convincing 111-run victory before New Zealand unleashed their wrath wining by a dominant 8-wickets. They may have lost to the juggernauts of Pool A, but the manner in which they did made for little hope from the outset. In their opener with Australia in Melbourne, they seemed almost apologetic—it was that much of a mismatch. "They outplayed us", a dejected Eoin Morgan acccepted defeat after the game. That would soon prove to develop into a broken record as frustration was abundant. In fact, to correct the England captain, they weren't just outplayed, they were taught a comprehensive lesson. Almost gravitating towards the test format, the 50-over game seemed far too unfamiliar for the side. Australia were helped on from 70-3 to 342-9 at the hands of some superlative batting along with poor fielding and lacklustre bowling. A tall order was assembled for the batsman, risks were in need of taking, but still there was a baffling disintegration. James Taylor—almost a wildcard selection for the game—was the shining star among the batsman. Moeen Ali just got to double figures, likewise with Gary Ballance, but Joe Root took 5 and captain Eoin Morgan went for a duck. Attempting to put away those hauntings from the opener, up next was the feared Kiwis. More humiliation was in store. They lost by 8 wickets as Tim Southee destroyed them going 7-33 in one of the most demolishing individual bowling displays in World Cup history. 9 runs from the last 6 in the order saw them bowled out for 33.2 overs. In a nutshell, it was the epitome of embarrassment. So one-sided, so dominant and for England, so worrying that it jolted their entire tournament hopes. With their total chased down in less than 13 overs, through Brendon McCullum's mind-boggling 77 runs off 25 balls. In hindsight it would never have been wise to place a bet on England winning their opening games, considering they were the hardest. However to lose in the manner they did, with little character, nowhere to hide and crushing confidence, was unexplainable. England then, expectedly steadied the ship with a thumping win over Scotland. Moeen Ali's huge 128-runs gave them their first win of the Cricket World Cup, but after the 172-run opening partnership they stuttered to 303-8, knowing they could've done so much better. That would be enough for then, but real problems will arise when they bumped into Sri Lanka. Following the win over Scotland there was some hope that they'd make the cut for the quarter-finals. Kumar Sangakkara slogged home a century as Sri Lanka thrashed the Three Lions in Wellington. Joe Root—who did make a steady improvement over the tournament—put 121 together to salvage their scoreline to a seemingly strong 309-6. Still, there were questions on the pace at which they played, the team could have added some more crucial additions to their total which may have tilted the game in their favour. Pacing issues aside momentarily, their bowling let them down this time. It proved another occasion where the batsman and bowlers couldn't form a cohesive unit which indefinitely would have provided them the victory. Thirimanne and Sangakkara slogged them all over the place and in good time too with 16 balls to spare, losing just a wicket. To be given enough time to have that safety buffer and get the margin says it all about England's bowling—insufficient. After that the odds were up against them. It was too little, too late as Bangladesh edged them by 15-runs. Jos Butler put up the cornerstone innings this time but once again in vein as his 65 runs were not enough as England were bowled out for 260. And after that, they were at the mercy of the back pages and critics. England and Wales Cricket Board managing director Paul Downton stated that the head coach Peter Moores would stay on, despite their exit at the hands of Bangladesh. "I've got full faith in Peter Moores. He will stay," he said. Poll: Should Peter Moores stay on as England Cricket coach? While many others called for his departure faith was retained—but one must question, this cannot be a time to regroup when it's about changing from top to bottom to stop this happening again? England endeared a whole host of problems in their campaign. Consistency was non-existent, players were out of phase, and never did they really manage to just, click. The lineup was a muddle, the best cricketing was hardly yielded. Something must be going wrong deep at the core—is test cricket the far preferred option? After England reached the 1992 final, they've never amounted to the success that they are capable of. This marks the third time since 1992 in which England have been knocked out of the group-stage in the World Cup, so lessons clearly have not been learned. More pain is felt from the England cricket World Cup campaign. They have been sent into a tailspin—the future looks dark because once again, they have missed the mark by a long shot—similar to the boundaries they woefully conceded throughout an embarrassing tournament. England suffered another World Cup disaster - how can they recover? Nisar Khan examines.